For the person in your life that has everything or the budding java aficionado, coffee related presents can bring your gift game to the next level. Whether you’re interested in specialty coffees, coffee accessories, or a coffee gift basket for a friend or loved one, there are a ton of options. With Christmas themed gifts you can be the ultimate secret Santa. Cozy winter themes and treasured gifts can help enjoy your loved ones enjoy their cup of all year long. Sit back and take a sip of coffee while you’re perusing our 11 Great Christmas Gifts for Coffee Lovers. If your coffee lover likes a bit of variety then this gift set is perfect. There are 12 different coffee flavors contained in the pack, from cinnamon to chocolate to breakfast blend. The presentation is key for the festive period and these coffees come boxed in a lovely holiday gift box, meaning the coffees are displayed in full view. If you purchase this as one of your Christmas gifts for coffee lovers then hopefully, you will get to sample some of the great flavors in return and enjoy the health benefits of drinking coffee. This coffee selection box has a great festive feel to it and has some good reviews on Amazon. Not only is this a good pick for lovers of flavored coffees, but there are some traditional coffees featured too. There are 12 1-ounce packets contained, which is great for enabling a try of all the flavors on offer. No need to worry about wrapping as the coffees come in a lovely gift box, just add a green or red bow and away you go. Perhaps the coffee lovers in question have an eye for style. If so these beautiful spoons are a must-have gift. 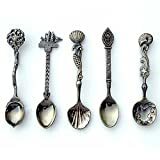 You will receive 5 spoons carved to perfection, each different in design, ranging from a shell to a boat. This product has some excellent reviews on Amazon and the spoons are even dishwasher safe which is an added bonus. If both coffee and fashion are key then this unique piece of jewelry will be right up their street. This necklace is silver in design and features a glass orb filled with coffee granules and an adorable takeaway coffee cup charm, guaranteed to make the wearer stand out from the crowd. Whether they prefer an Americano or a cappuccino this gift is the best and bound to make them smile. This authentic traditional coffee set is made in Turkey and formed from copper for that rustic look. The products are engraved with a lovely intricate design and features 2 cups and saucers, small bowls a server and a handy tray for carrying. You also have the added bonus of inclusion of 2 packs of coffee so that you can get brewing straight away. One of the perfect Christmas gifts for coffee lovers. If you are looking for coffee of a better quality and higher grade then this sampler box might just do the trick. With some good reviews, people have commented to say that the product is a little pricey but feel this is worthwhile due to the excellent quality and rich flavor. Served up in a festive gold and silver gift box, this is one of the best coffee pack gifts we have seen. Presented in a sleek and stylish silver gift box this coffee sampler is perfect for drinkers of good quality coffee. The coffee included in this set is 100% Kona and a review panel for the producers rated this the best Kona coffee gift, surely this should give it a seal of approval. Your box will include 3 packs of top quality Kona coffee, each pack weighing in at 2 ounces. 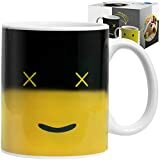 If you are looking for something a little different and buying for somebody who has that fun factor then why not consider this smiley face mug. To reflect the disappointment of your coffee lover when their cup is empty, the cup shows a sad face, and when the mug is filled with delicious hot coffee the frown is then turned upside down to show a smiley face. Perfect as a funky and festive gift. If your husband is a lover of coffee, look no further because we have the perfect gift for him. This modern glass mug is adorned with the text ‘best husband ever’ which is perfect to show him your appreciation. Reviews suggest that this product is of really good quality and can be put through the dishwasher, excellent as we all know husbands would rather dodge the washing up. If you know somebody who is a Star Wars fanatic and a lover of coffee then this one is the best gift for them. The mug enables you to sip your coffee at your desk but also acts as a travel mug so you can take it with you wherever you go. There is some added wow with cool technology that enables the mug to stir itself, you just need to press a button to give your coffee that perfect stir. 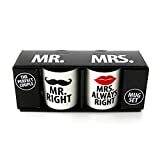 If you are buying for that perfect couple then this mug duo has the comedy factor. With one mug stating ‘Mr. Right’ and the other ‘Mrs. Always Right,’ this best gift for coffee lovers is bound to bring about some laughs. With high ratings on Amazon and coming in a handy gift box, this gift is just perfect for Christmas. Emojis are all the rage at the moment, so why not buy on trend with this colorful and funky coffee mug. Maybe more suitable for the younger generation but will also be appreciated by those who like a splash of fun and color. There are 4 fun designs to choose from and although perfect for that cup of coffee, they are ideal to hold hot cocoa too. Nothing could be better than snuggling up with your favorite cup of coffee and watching a movie, especially at Christmas. This festive mug is a perfect match to go with all of those festive movies. If you are struggling for ideas, then look no further as this is a great all-round gift to please all coffee lovers. With some good reviews on Amazon, these mugs are dishwasher and microwave safe and come really well packed to prevent damage. Enjoy different types of coffee with this cup while watching a movie. Calling all tech-lovers! We all know somebody who can’t help posting about their coffee drinking antics. 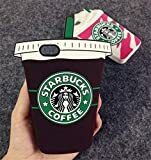 If this sounds like somebody you know then make sure they are posting to social media in style by purchasing them this coffee themed mobile phone case. Made from silicon, this case is great quality and is compatible with the iPhone 6 plus model of phone. If you are looking for a household gift for your coffee lover and are out of ideas, then why not opt for this vintage looking coffee spoon and ceramic rest. We all know what annoying mess can be created when placing a coffee spoon straight onto the kitchen surface, so this piece of kit helps with cleanliness as well as looking great. The spoon is metal and there are a few different coffee-related slogans to choose from for the spoon rest. If you are struggling for Christmas gifts for coffee lovers, then look no further. This ultimate gift box is for all the pro coffee drinkers out there. 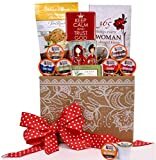 The products in this gift box are Christian themed and designed for women in mind. Each basket contains 3 mugs, a magnet, a book for women and a selection of coffees and treats. Perfectly packaged for Christmas, the box is finished with a lovely festive bow.